Sen. Shelley Moore Capito, R-W.Va., was the first to say that she wouldn't support the repeal effort because of the threats it poses to people's coverage. She was followed by fellow Republican Sens. Susan Collins of Maine and Lisa Murkowski of Alaska. The replacement bill's language is based on the repeal bill that that passed by the House and Senate in 2015 but was vetoed by President Barack Obama. Here's how the repeal would have changed the Affordable Care Act, compared with the House and Senate bills. While McConnell and Trump called this plan a straight repeal of the Affordable Care Act, it would in fact have left many parts of the law in place. That is because under Senate rules, legislators can only repeal the parts of the law that have a budget or tax impact. The individual mandate that everyone, healthy or sick, must buy insurance would disappear. But the rule that insurers must write policies for anyone, no matter their health status, would stay. "Insurers would have to take people with pre-existing conditions, but the sense is that healthy people without that mandate wouldn't sign up," says Larry Levitt, vice president of the Kaiser Family Foundation, a health care research organization. "So insurers, with that kind of uncertainty, would immediately raise rates." The Congressional Budget Office analyzed the 2015 legislation in January and said that if it was to pass, insurance premiums would rise 20 percent to 25 percent in the first year. 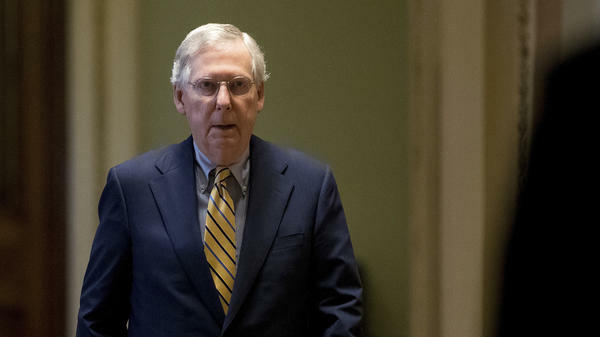 Under McConnell's plan, that would have been 2018. Those high prices would have driven millions of people out of the insurance market. The same CBO report estimated that the number of people without insurance would increase by 18 million in the first year if legislation similar to the 2015 bill became law. That is almost the same number of people who gained insurance in the seven years since the Affordable Care Act passed. About 10 million people would have lost coverage because they would drop their individual plans, 5 million would be dropped from the Medicaid rolls and 3 million would lose their employer-provided coverage, the CBO said. It also said that within 10 years, 32 million more people would be without insurance than if the ACA stayed in place. Rising rates and fewer people in the market are the two ingredients for the much-invoked "death spiral." That would occur if rates rise so much that nobody can afford insurance and the entire market collapses. And that is what the Republican's proposed repeal of the Affordable Care Act, or Obamacare, would have done, according to multiple health care analysts. Robert Laszewski, president of Health Policy and Strategy Associates, a consulting firm, says a repeal and delay "would just cause more market calamity without a known replacement."